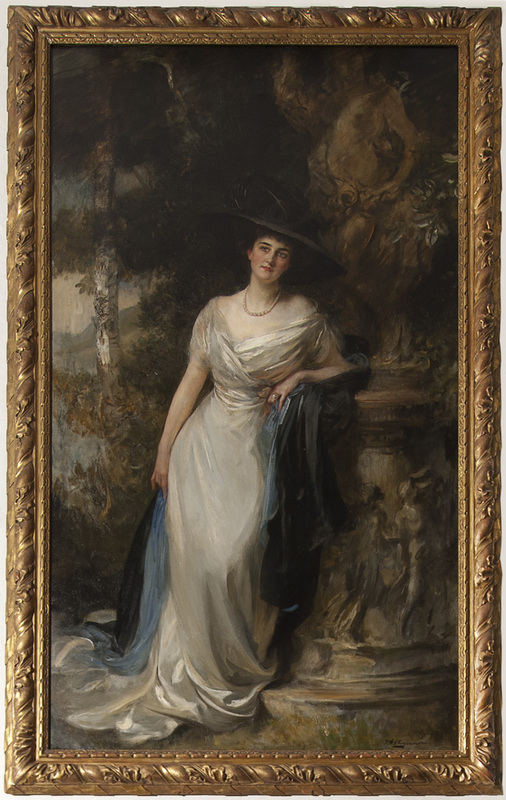 Portrait of Nanaline Holt Inman Duke (1871-1962), full length, in a white dress wearing a black plumed hat and pearls, with a blue shawl, leaning against a pedestal in a landscape, in a carved and gilded wood frame. Nanaline was the widow of wealthy Atlanta-based cotton merchant, William Inman, when, in 1907, she married tobacco and energy tycoon James Buchanan Duke. At the time she had a twelve-year old son, Walker. She was also the mother of Doris Duke, born 1912, in New York City. From 1912 to 1957, this portrait of Nanaline Duke hung in the library of 1 East 78th Street, New York, NY. It was moved to Newport, RI, in 1957 or 1958 when Doris Duke gave 1 East 78th to NYU to house its Institute of Fine Arts and began to refurnish and re-establish a residence at Rough Point, her childhood summer home, which had been emptied and unoccupied from 1954 to 1957.